Vish tries to put a thread on her neck, but the baby girl throws it away and pushes Vish. Sumitra says to them that the baby girl doesn’t like any stranger touching her. Vish says to Bela that she is shocked to see the baby girl. Bela says that when she grows up, then she will come into her real avatar. Vikrant says that once she gets matured, then she will get all her powers. Vikrant says that after she grew up, then she can’t become a good person. Vish says that she can become a good person. Bela says that for doing this, they need to take her to Aghori Baba. Bela says that Aghori Baba can kill the evil in the baby, but Tamsin won’t go so easily with them. Mahir comes to Kuhu and Bultu to see them. Mahir reveals to them that the baby has grown up to 5 years and take them with him. Kuhu puts Holi colors on Mahir and Mahir also wish her the same. Tamsin is playing with a toy and Vikrant comes to her. Tamsin asks him to leave her toy. Vish also comes there and Vikrant starts playing with Vish. Tamsin is happy to see all this. Vish gives the toy to Tamsin to run behind Vikrant. Vish touches Tamsin and Tamsin says that she doesn’t like anyone touching her. Tamsin says that as Vish is playing with her so she can touch her. Sumitra is finding Tamsin and Bela throw colors on her. Sumitra shouts at her. Bela put more colors on her. Bultu comes to Rohini and compliments her beauty. Bultu put colors on her and Sumitra comes there. Bultu leaves from there. Rohin shouts after seeing her face in the mirror. Bela comes to Tamsin and says that she knows why the women were shouting? Tamsin says that she doesn’t know and is not even interested to learn about it. Bela says that it’s good to avoid keeping track of stupid people. Bela says that she has put colors on Sumitra and Rohini is also in colors. Tamsin ask whether they are looking bad? Bela says that they are already bad and looks funny too. Tamsin laughs after hearing it. Bela asks Tamsin to play Holi. Tamsin asks what is Holi? Vish and Vikrant tell about Holi to her. Tamsin gets excited to play Holi and goes out with them. Alek comes to Sumitra and Rohini and says that Vish and Vikrant are playing with Tamsin. Alek says that Mahir has gathered people to play Holi. Sumitra gets worried that Mahir is doing all this just for a plan. Sumitra says to Alek that all the people are Naag. Sumitra asks Alek to inform all this to Hukum. Tamsin is running outside to play Holi and Sumitra stops her. Tamsin says that she doesn’t like anyone interrupting her. Sumitra says that she wants to play Holi with Tansim. Sumitra goes to Vish and Vikrant and says that she has come to interfere with them. Tamsin says that she doesn’t like to wait at all. Bela comes there to take all of them to play Holi. Bela ask Sumitra also to come. Sumitra denies coming. Tamsin says that she doesn’t want to wait anymore. Sumitra comes to Tamsin saying that there’s no need to play Holi. Tamsin says that she wants to play Holi and leaves from there. Sumitra was about to go from the back side to check Bela. Kuhu comes there and ask her to wish Holi. 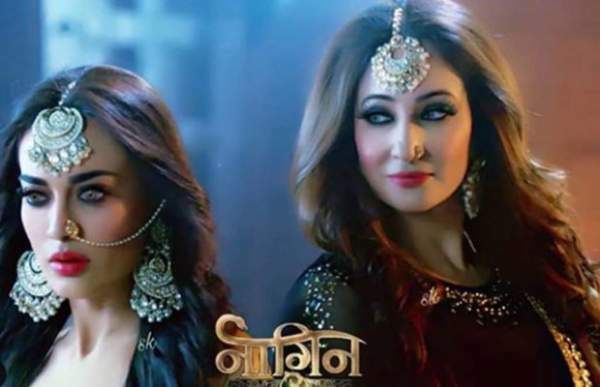 Sumitra comes in her Naagin avatar. Kuhu throws something on Sumitra and Sumitra comes back in her human avatar. Rohini comes to Kuhu from behind and asks what is she holding it? Rohini and Sumitra say that she should have a back-up plan in this house. Bultu traps Sumitra and Rohini for escaping Kuhu. Alek is finding Hukum and comes to him, saying that Bela has planned something. Hukum comes to Alek that if his baby got hurt anyhow, then he will kill everyone. Hukum goes to check Tamsin. Bela asks Tamsin to go on a ride. Tamsin says that when she gets tired after playing Holi, then she will go for a ride. Vikrant says that they need to wait for some time as they need to escape Tamsin from Hukum also. Vikrant says that the water is Ganga Jal and Gulal is Abhimantrit Sindoor for putting it on Hukum. Vikrant says that until then, they can play Holi. Bela and Mahir start playing Holi. Vish asks Vikrant to correct his mistake as when they were getting married, he wasn’t aware that she is Vish and not Bela. Vikrant takes the sindoor and applies it on Vish’s forehead. Hukum comes down with Alek. Alek tries to help Sumitra and Rohini. Hukum goes to check her baby. Sumitra asks Hukum to take them out of the trap. Kuhu and Bultu try to run and throw away the Abhimantrit sindoor on Hukum and everyone. Hukum says that it is not a color but sindoor and ask them to find her daughter. Kuhu and Bultu come to Mahir and everyone. Bultu says that Hukum has come out. Bela tries to cover Tamsin so that no one looks at her. Sumitra, Alek, and Rohini come to find Tamsin, but Bultu and Kuhu trap them. Hukum also comes there, but Bela hides Tamsin. Hukum comes to Tamsin. Vikrant and everyone take the Gangajal and Abhimantrit sindoor. They throw all this on Hukum and Hukum falls down. Precap: Tamsin says that she has no father and she is alone. Hukum gets up to hit Bela and her team. Tamsin is pushing a car towards Hukum to kill him! Tamsin throws something on Hukum from her eyes to hurt him!